The schooling years in the Japanese education system are segmented along the lines of 6-3-3-4: 6 years of primary or elementary school; 3 years of middle or junior high school; 3 years of high school; and 4 years of university. However, the government announced (October 2005, Daily Yomiuri) that it intended to make changes in the Education Law to allow schools to merge the 6-3 division between elementary and middle schools and to create an integrated curriculum. The key purpose for this change is to allow elementary and middle schools to pool or share their resources, with special regard to making available specialist teachers of middle schools to elementary schools. See the current blog discussion as well as discussions and chats at http://groups.yahoo.com/group/edn-in-jpn/. Many private schools, however, offer a six year programme incorporating both junior high school and high school. Specialized schools may offer a five year programme comprising high school and two years of junior college. There are two options for tertiary education: junior college (two years) and university (four years). A school year has three terms: summer, winter and spring, which are each followed by a vacation period. The school year begins in April and ends in March of the following year. An elementary school (from 6 years) and junior high school (3 years) education, i.e. nine years of schooling are considered compulsory (see pages on legality of homeschooling). Compulsory education covers elementary school and junior high school. A break from the past, modern public schools in Japan today are mostly co-ed(more than 99% of elementary schools). The Japanese school year begins in April and students attend school for three terms except for brief spring and winter breaks and a one month long summer holiday. Japan has 23,633 elementary schools, 11,134 junior high schools, 5,450 senior high schools, 995 schools for the handicapped, 702 universities, 525 junior colleges, and 14,174 kindergartens (May 2003 figures). School attendance rate for the nine years of compulsory education is 99.98%. About 19.2 million students (MEXT 2012 figures) were enrolled in educational institutions in Japan from the kindergarten to university levels. and 120,195 in other types of schools. Japanese children enter primary school from age 6. The average class size in suburban schools is between 35-40 students, though the national average had dropped to 28.4 pupils per class in 1995. 70% of teachers teach all subjects as specialist teachers are rare in elementary schools. 23.6% of elementary school students attend juku (mostly cozy family-run juku). Suburban schools tend to be large with student populations ranging from around 700 to over 1,000 pupils, while remote rural schools (19% of schools) can be single-class schools. From age 12, children proceed to middle schools. At this point, about 5.7% of students attend private schools. The main reasons why parents choose such schools are high priority on academic achievement or because they wish to take their children out of the high school selection rat-race since such schools allow their students direct entry into their affiliated high schools (and often into the affiliated universities). Parents who select a private junior high school for their child tend to be parents with time and economic influence (home-makers or self-employed with one child) base their decisions and place top priority on academic achievement. The most common reason for sending their children to a private junior high school was that they wanted their children to achieve a higher level of academic achievement. Parents who select public junior high schools make their choice on the basis of location, incidence of bullying, and personal guidance. Among parents who selected a public school outside the school district, 45% reported that a particularly important criterion was little incidence of bullying and truancy, indicating that bullying was a crucial consideration. The most important criteria for these parents in selection were distance to school, environment and whether good friends also attended the school. A large percentage of parents (65.1%) tend to select the school based on hearsay. 90.8% of the parents send their children to a juku or cram school, and those whose children attended cram school four or more days a week accounted for 65.2%. 98% of 15 year-old middle-school graduates go on to high schools or private specialist institutions. A high-school diploma is a considered the minimum for the most basic jobs in Japanese societies. The rate of students who advance on to senior high schools was 97.0% in 2002. One-fourth of students attend private high schools, a small number of which are elite academic high schools. Over 97% of high-school students attend day high schools, about three-fourths are enrolled in academic courses. Other students are enrolled in the one or other of the 93 correspondence high schools or the 342 high schools that support correspondence courses. There are 710 universities (not counting junior colleges). Almost three-fourths of university students are enrolled at private universities. The rate of students who went on to universities and junior colleges was 44.8 %. Special education institutions exist: 70 schools for the deaf (rougakko); 107 for the blind (mougakko); 790 for those with disabilities (yougogakko). This number is considered to be inadequate. Once-a-week moral education classes were re-introduced into the curriculum in 1959, but these classes together with the earlier emphasis on non-academic subjects are part of its “whole person” education which is seen as the main task of the elementary school system. Moral education is also seen as more effectively carried on through the school routine and daily interactions that go on during the class cleaning and school lunch activities. The middle curriculum includes Japanese, mathematics, social studies, science, English, music, art, physical education, field trips, clubs and homeroom time. Students now receive instruction from specialist subject teachers. The pace is quick and instruction is text-book bound because teachers have to cover a lot of ground in preparation for high-school entrance examinations. High schools adopt highly divergent high school curricula, the content may contain general or highly specialized subjects depending on the different types of high schools. More on the curriculum of high schools, visit the following link. Elite academic high schools collect the creme de la creme of the student population and send the majority of its graduates to top national universities. Non-elite academic high schools ostensibly prepare students for less prestigious universities or junior colleges, but in reality send a large number of their students to private specialist schools (senshuugakko), which teach subjects such as book-keeping, languages and computer programming. These schools constitute mainstream high schooling. Vocational High Schools that offer courses in commerce, technical subjects, agriculture, homescience, nursing and fishery. Approximately 60% of their graduates enter full-time employment. Correspondence High Schools offers a flexible form of schooling for 1.6% of high school students usually those who missed out on high schooling for various reasons. Evening High School which used to offer classes to poor but ambitious students who worked while trying to remedy their educational deficiencies. But in recent times, such schools tend to be attended by little-motivated members of the lowest two percentiles in terms of academic achievement. School life often receives bad press on delinquency, bullying (ijime) or behavioral problems or the spate of horrendous and baffling crime knifings and killings taking place in schools in the past decade that were once unheard of in the country. Student life in public elementary schools in general is however acknowledged by most Japanese to be largely enjoyable, except for some students that can set in during the transition to junior high school. Rigorous swotting for entrance exams is said to characterise student life in Japanese schools beginning just before entry to middle schools. To secure entry to most high schools, universities, as well as a few private junior high schools and elementary schools, applicants are required to sit entrance exams and attend interviews. As a result, a high level of competitiveness (and stress) is often observed among students (and their mothers) during pre-high to high school years. 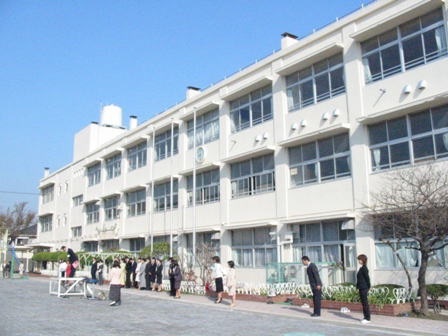 In order to pass entrance exams to the best institutions, many students attend private afterschool study sessions (juku or gakken) that take place after regular classes in school, and/or special private preparation institutions for one to two years between high school and university (yobiko). Children learn early on (beginning in preschool) to maintain cooperative relationships with their peers; to follow the set school routines; and to value punctuality (from their first year in elementary school). Classroom management emphasizes student responsibility and stewardship through emphasis on daily chores such as cleaning of desks and scrubbing of classroom floors. Students are encouraged to develop strong loyalties to their social groups, e.g. to their class, their sports-day teams, their after-school circles, e.g. baseball and soccer teams. Leadership as well as subordinate roles, as well as group organization skills are learnt through assigned roles for lunchtime (kyushoku touban), class monitor or class chairperson and other such duties. Despite the assigned leadership-subordinate roles, group activities are often conducted in a surprisingly democratic manner. Teachers usually delegate authority and responsibility to students. Small-group (han) activities often foster caring and nurturing relationships among students. The teaching culture in Japan differs greatly from that of schools in the west. Teachers are particularly concerned about developing the holistic child and regard it as their task to focus on matters such as personal hygiene, nutrition, sleep that are not ordinarily thought of as part of the teacher’s duties in the west. Students are also taught proper manners, how to speak politely and how to address adults as well as how to relate to their peers in the appropriate manner. They also learn public speaking skills through the routine class meetings as well as many school events during the school year. Noisy and lively classrooms, the absence of teacher supervision along with the effective use of peer supervision are most often noted of elementary school classrooms. Homework workload is not overly heavy at this stage, daily portions typically comprise kanji (Chinese characters) or kokugo (Japanese language) worksheets and one or two pages of arithmetic worksheets. Various after-school hamako or club activities or remedial classes may be held by individual home-room teachers (or schools) as they see fit. Middle-school (i.e. junior school) instruction of academic subjects shifts gear into intense, structured, fact-filled learning and routine-based school life. Small-group han are dispensed with during academic classes. Hierarchical teacher-peer and senior-to-junior relationships as well as highly organized, disciplined and hierarchical work environments such as various established student committees, are observed at middle schools. Hi and thank you very much for sharing such a good article. Just a little bit curious about the survey conducted in 2005. Is it possible that some more information about this survey be shared? Thanks. It’s excerpted directly from the news article, Yomiuri Shimbun, as is. I don’t have it here, but it’s probably uploaded under the Edu News under the pull-down menu. Can’t tell you exactly where though, sorry. Was a while back. You can ty the search function on the site. I really like the article. May I translate the article of Japan education system and publish it in my blog (http://www.egitimikursu.com). I will also reference you rblog. There is no “American model.” Under the US constitution states manage education. Most states leave details of how schools are organized to cities and counties. The 6-3-3 pattern is in fact extremely rare in the US. That this came from the US is a popular myth in Japan. It has no basis in fact. Bear in mind the period in which the 6-3-3 plan, was popularized – as it is called by many states’ educational departments. In Japan, 1926 (shortly after the model took hold in the US) was when the 6-3-3 model began to be debated over and by the time of the US Occupation, the 6-3-3 was already a popular idea in Japanese circles as the way forward for educational reform. And 6-3-3 was introduced as a pillar of educational reform during the Occupation in 1949 as a direct consequence of the Report by the 27 visiting educational experts’ and the recommendations by the US Education Mission and the Education Reform Committee. The 6-3-3 was engineered between Nambara and George Stoppard in a secret meeting behind the Japanese Ministry of Education’s back. The key reasons for this was the desire to have what was the democratic and egalitarian model of education as opposed to the militaristic and autocratic education that had been in place up to then, and especially to break the the Koto Gakko’s stranglehold of elitist Imperial University system. There are several reliable sources of documented information on the introduction of the 6-3-3 model, including the Ministry of Education of Japan, and academic books on education in Japan such as Education Reform in Japan and History of Education in Japan…so the idea that the 6-3-3 system is the result of US influence and based on the US model is no myth at all. You can follow the links below. really this is a good information.thanks for sharing this post.